After Unimaginable Destruction and Misery, a Marshall Plan for Nepal? Nepal’s path to reconstruction after it was hit with a 7.8 magnitude earthquake won’t be easy. In a small village in Nepal, an old woman is picking up whatever belongings she can scrounge from the rubble, all that remains of her one story home. Sifting through the pile of debris, she lays her hand on a small shoe and suddenly freezes. She starts wailing. The shoe belonged to the woman’s 8 year-old granddaughter, Padma, who was crushed under a pillar when the family house collapsed in the magnitude 7.8 earthquake that hit Nepal last Saturday. By the time her father came to rescue her, the young girl had succumbed to her injuries. Fifty meters away from the old woman’s house, Laxmi and Manilal Thapa are trying to pull a few sacks of grains from what’s left of their house. They have dug a few potatoes from the debris and hope to find some rice, allowing them to cook their first meal in two days. Ever since the tremor hit, they have been in a daze. They mourn Manilal’s wife, who lost her life saving their two children, protecting them from a collapsing wall to save their lives. But the family cannot mourn for long. Manilal and his sister, who also lives in the neighborhood, continue to frantically search through the debris, hoping to find their two goats that still remain buried. Further down in the street, a group of men sit in a makeshift tent, wearing white robes. All around them are ruins and rubble. The compound of five houses that they once lived in are now completely shattered. The men have lost their family’s patriarch in the earthquake. The 72 year-old was napping when the tremor struck and was crushed under the weight of the terrace wall. In the village of Jeevanpur and Chhetria Deurali, 50 kilometres away from the capital of Kathmandu, almost every household is in mourning. The destruction is widespread and all encompassing. Further West of the capital, the extent and magnitude of the tragedy continues to multiply, especially in Pokhara, the epicenter of the earthquake. In village after village, home after home, the disaster has inflicted untold misery. Most of the villages are located in tough terrain, far from passable roads. Reaching Jeevanpur village in Dhaing district, which is rather close to the capital, requires a ten kilometer trip navigating steep slopes. When I reached the village 48 hours after the earthquake, no help had arrived to take care of the victims. Neighbors had to call on each other to cope with the disaster. It’s been almost a week since the tragedy struck Nepal. But despite the international community’s effort to help out, the majority of the affected villages remain beyond reach. When help does reach these communities, it’s often insubstantial and gets there too slowly. How will the region recover from this irreparable loss? This cynicism and hopelessness is common among the Nepalese. As a journalist, who has visited many different areas in Nepal affected by the tragedy, I wonder how much the international community will aid in the reconstruction effort. Some areas of this beautiful country have been completely destroyed. Nepal is in the need of a “Marshall Plan,” just as the United States provided for Europe after World War II to rebuild the war devastated continent. The countryside’s connections with towns and cities are poor. Many parts of Nepal are not easily accessible. 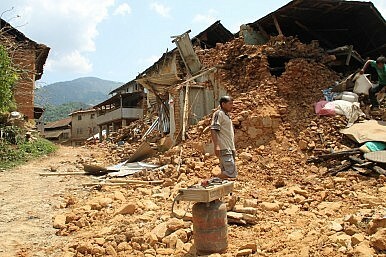 National and international attention should focus on rebuilding Nepalese infrastructure and rebuilding it better. The country is in a highly sensitive seismic zone and the repetition of such a destructive earthquake is possible. Therefore, any reconstruction of the nation has to be done keeping this geographic reality in mind. The international media’s coverage of Nepal is already waning. It’s important for the world to stay focused on the ravaged country. Once the rescue and rehabilitation takes place, the real challenge will begin. That will be the challenge to rebuild Nepal. Findings from a new survey show that a year on from Nepal’s earthquake, communities are struggling to get by as reconstruction aid fails to arrive.